Arrive in Fukuoka. Someone will meet you at the airport or train station. We'll check you in to a near by hotel and get your bike fitted, assembled or both. Day 2: Ride: Hita to Yufuin. 60-70km. Rolling terrain with to big mountains. Shorter day but difficult. As an option we can drop off our bags at the ryokan, climb Mt. Yufu and do some sightseeing in Yufuin which is famous for their onsens. Day 3: Ride. Yufuin to Oita. 60km. Rolling terrain. Big steep climb out of Yufuin over the back side of Mt. Yufudake. Crazy fast, fun descent into Beppu. One more climb to Oita. Stay in Oita's Red Light District and enjoy some night life. Next day is an optional rest day. Day 4: Optional Rest Day or Optional 30k site seeing ride in Beppu. Also, visit the Oita Castle ruins. Day 5: Ride: Oita to Saiki. 90-100km. Mostly flat along the Pacific Ocean. Quiet, beutiful winding road along the coast through small fishing villages. Saiki is a small town famous for it's sushi and sashimi. Day 6: Ride: Saiki to Nobeoka. 80km. Rolling with some small climbs. Beautiful coastline with options to do some climbing in the mountains. Nobeoka is known for having one of the most beautiful beaches in Japan and the best Chicken Nan Ban in the world. Day 7: Ride: Nobeoka to Miyazaki. 80-100km. On this day we have a few options. We can do a mountain route, coastal route or a combination of both depending how the group is feeling. Day 8: Ride: Miyazaki to Kirishima. 80km. 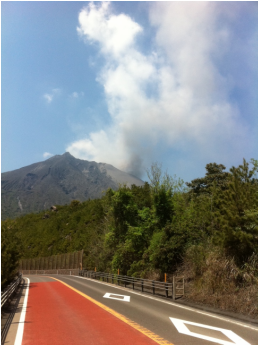 Epic ride and climb over Mt Shinmoedake (active volcano) in the Kirishima Mountain Area. Day 9: Ride: Kirishima to Kagoshima 40-80km. depending on the route and how the group is feeling at this point.